Before we know it, 2017 is about to culminate in to a brand new 2018! Mumbai is considered to be one of the best places to celebrate New Year in India. While sitting at promenades and dancing at clubs has become passé, hunt for new ideas to celebrate New Year 2018 has already begun. A lot of people like to travel out of town to some hill station but even they are jam packed and all we get out of the experience are overcharged hotel rooms and lots of complimentary traffic! If you love nature and are looking for that much needed peace then you should definitely taste the latest bestselling dish – New Year Camping. We have carefully curated a list of camping activities which you can enjoy with your families and friends to bid adieu to 2017. Want some more good news? Small Steps Adventures undertakes bookings for private groups as well as corporate team outings! So stop thinking and start reading about the unique ideas to celebrate New Year near Mumbai. This is one of the best options to opt for if you are planning to camp with small kids. The campsite is furnished with a nursery and this makes it an ideal location for parents to spend their time away from the chaotic Mumbai New Year’s Eve 2017. 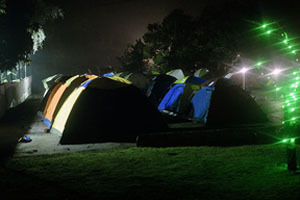 The campsite is surrounded by chickoo plantations where campers are exposed to campfire and dancing at night. The Dahanu beach is located 10 km from the campsite and this makes it an ideal location to spend the New Year among clear skies and twinkling stars! Want to know about another location that would give a serious competition to New Year events in Mumbai 2017? 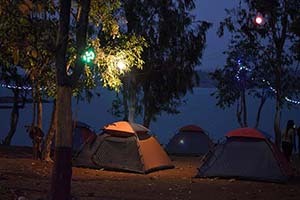 It is none other than one of our most popular offerings – Camping at Pawana Lakeside. This serene location is most suited for a fun filled celebration in the midst of nature. The pawna lake campsite is very easy to locate and campers are required to reach the campsite by their own vehicles. 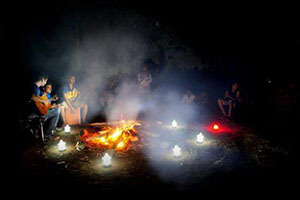 Once there, they would be treated with an amazing campfire with DJ music and a delicious buffet spread for dinner. The next morning is free for campers to indulge in witnessing the sunrise, bird photography or simply a dip in the lake post which they will return home with pleasant memories and new friends. This camp begins with a warm welcome followed by hi-tea and snacks post which the campers are free to interact and settle down. Then begins a night to remember with good food, good music and a very good night! Campers are expected to check out post breakfast so that they can reach home early indulge in some more celebration in the city! Lonavala has always been a favourite destination for Mumbaikars. Why not explore another side of the popular hill station? 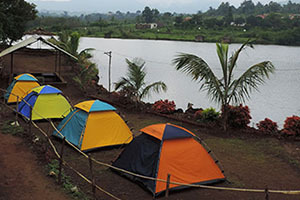 We welcome you to a private campsite organized on a hill top from where campers can enjoy a fabulous view of the Pawana Lake and explore the nearby areas by going for a nature trail. 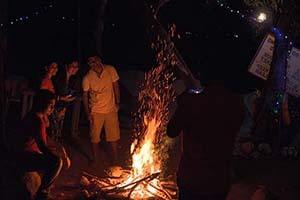 The night is made an enjoyable experience due to the presence of campfire, DJ and a sumptuous dinner spread. Nestled in the picturesque location of the Tikona fort, the Hadshi Lake is a little paradise. It is surrounded by hills and this makes it a great location to click selfies and indulge in some landscape photography. Campers can experience this not-so-explored location with their friends, families or both! There are provisions for snacks, entertainment, dinner, campfire and loads of happy memories. 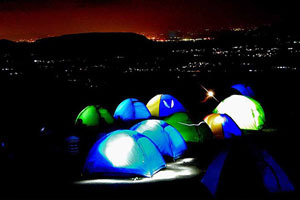 If you are an adventure lover and would prefer to ring in the New Year with some action then a night trek to Prabalmachi would be the best bet. Prabalmachi is the village on plateau from where one can easily reach to Kalavantin fort and Prabalgad. We will start late in the evening from the base village Thakurwadi and ascend to Prabalmachi camping plateau, the campsite. Campers will be treated to dinner post which they can enjoy campfire and spend the night under the stars. The next morning will see them start descending after breakfast post a chilly night. Those who want to quit smoking or drinking and decided for New Year resolution 2018 can join as there is no scope for it during the event. It’s purely adventure style New Year Celebration. Camping by the river is a great chance to celebrate the New Year. It offers a wonderful combination of nature and the zing of adventure that comes with exploring the unexplored. 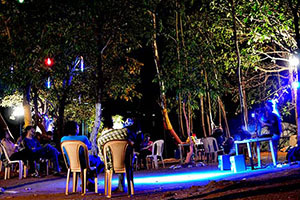 Bhatsa Riverside camping is an ideal place to be if one wants to experience the bliss of nature. Campers are welcomed and inducted about the New Year celebration activities. 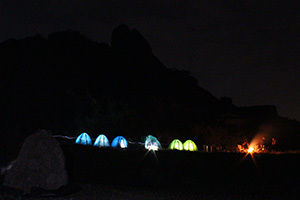 They are offered delicious food with campfire and also get to experience the feeling of spending the night in a tent. Late night movie screening beside lake gives awesome experience of open theatre. We just can’t get enough of Pawana Lake! This camp though organized near the Pawana Lake is at a completely different location from the camp at Kevre but is as much fun! The campers are free to explore and indulge in photography, swimming and star gazing post a campfire and an open dance floor and the lights are put out only after the special celebration at midnight!